Belgium is located in northwestern Germany. It is bordered by France, Germany, the Netherlands, and Luxembourg. Google Earth is a free program from Google that allows you to explore satellite images showing the cities and landscapes of Belgium and all of Europe in fantastic detail. It works on your desktop computer, tablet, or mobile phone. The images in many areas are detailed enough that you can see houses, vehicles and even people on a city street. Google Earth is free and easy-to-use. Belgium is one of nearly 200 countries illustrated on our Blue Ocean Laminated Map of the World. This map shows a combination of political and physical features. It includes country boundaries, major cities, major mountains in shaded relief, ocean depth in blue color gradient, along with many other features. This is a great map for students, schools, offices and anywhere that a nice map of the world is needed for education, display or decor. If you are interested in Belgium and the geography of Europe our large laminated map of Europe might be just what you need. It is a large political map of Europe that also shows many of the continent's physical features in color or shaded relief. Major lakes, rivers,cities, roads, country boundaries, coastlines and surrounding islands are all shown on the map. Anderlecht, Antwerpen, Bastogne, Beerse, Blankenberge, Brugge, Brussels, Charleroi, Eupen, Gent, Hasselt, Liege, Lommel, Maastricht, Mons, Namur, Oostende, Overpelt, Schaerbeek, Spa, St. Truiden, Tienen, Tongeren, Turnhout and Waremme. Albert Kanaal, Blankaart Lake, Dender River, Deurne Airport, Etang de Virelles, Hofstademmer Lake, Meuse River, North Sea and Schelde River. Belguim's mineral resources consist of construction aggregates, silica and carbonate sands. 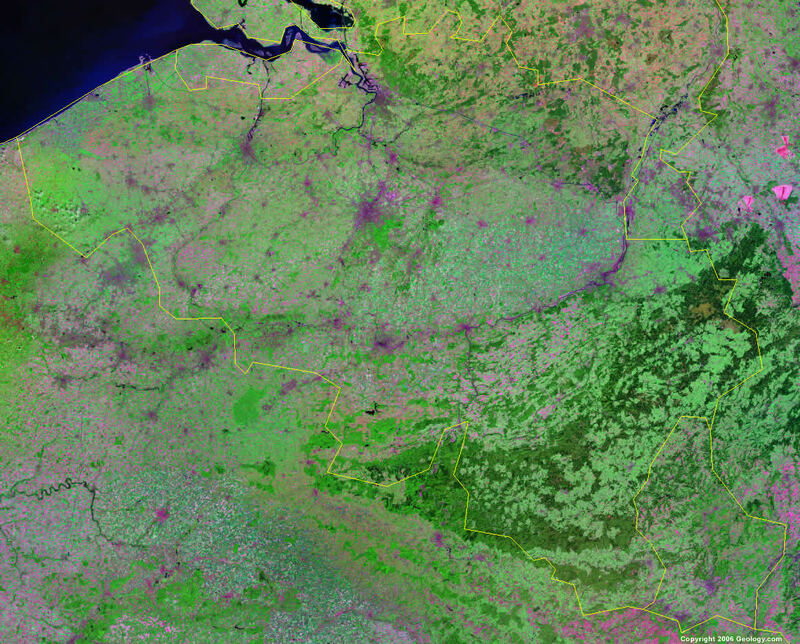 The country of Belgium is protected from the sea by concrete dikes; however flooding is still a threat along rivers and in areas of reclaimed coastal land. The country of Belgium has numerous environmental issues. The environment is exposed to intense pressures from human activities, by way of urbanization, dense transportation network, industry, and extensive animal breeding and crop cultivation. Their air and water pollution issues have repercussions for neighboring countries, as well. Although Belgium has been slow in the progress of tackling the country's environmental challenges, due to the uncertainties whether they were federal and/or regional responsibilities, these matters have now been resolved.